Web Hosting Services – Oklahoma City, Oklahoma – UptimeSpy, a free website monitoring services provider, today announced the company is now offering premium monitoring services for only $10.00 a month. 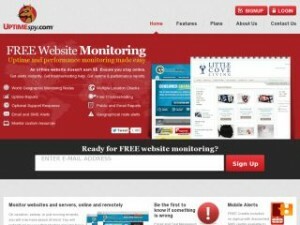 The premium plan includes unlimited SMS and email alerts and allows webmasters to monitor up to 30 websites at a time. Most monitoring accounts are activated within five minutes. Customers can choose to select more than one monitoring node and they can purchase more SMS credits to receive alerts on the road. With UptimeSpy’s web monitoring service small businesses and online stores can ensure peak website performance, increase page load times and they can instantly ascertain that all website applications are running properly. Website monitoring isn’t very technical as it is simply the process of testing and verifying that a company’s customers can interact with a website or a website’s applications from different parts of the world throughout the day. While there are several technical applications to website monitoring, it is mainly used to ensure that websites are live and responding to viewers. Webmasters can use monitoring data to generate trends that show performance over time, and highlight a range of factors that could affect the functionality of a website. Launched in 2008, UptimeSpy provides the industry’s first free, comprehensive worldwide geographic monitoring service, enabling webmasters to see real-time uptime and performance results from nodes located around the world. With no usage limits and an intuitive user interface, UptimeSpy provides a vital service to webmasters and web hosting providers. For more information about UptimeSpy, please visit www.uptimespy.com.